Hail Metalheads! One of the last times you saw my name on a review, I had the pleasure of talking about an album by one of my local favorites, UNENDLICH. Since that review, not only have I sat behind a kit to work with him, but now have the privilege of calling Mike Connors my friend. For those who have enjoyed his previous albums, you already know that Mr. Connors shows no lack of talent (considering that he has been the only member for the first two albums). Well he’s still at it, and I am very pleased to introduce his 3rd full length masterpiece “Thanatophobia”. Now the first thing you may have noticed, is that there is a second member this time around. He brought in drummer, Anthony Rouse, to record on “Thanatophobia”. This is a fresh change, let’s face it, what’s better than the real thing. (I still love the other works of UNENDLICH.) Anthony brings a lot to the table. His talent is certainly showcased across the album, and he does give the album that perfect black feel as you listen. This album does take us in a different direction than the previous albums. Mike and I had even spoke about what he had been planning for “Thanatophobia”. From the waltzlike 3 count madness that is “Already Dead” to the soothing clean vocals in “My Own Misery”. Everything has been methodically and painstakingly forged into perfection by the maestro. Speaking of “Already Dead”, if you look around Facebook Land, you will find a raw demo with your boy here on the drum kit. This time around you’ll notice that has added a lot of melodic elements. Though he executes it perfectly in that raw grim style that has made UNENDLICH the unstoppable beast that it has already become. Now for those familiar with me, you know that I get excited to promote my local scene, and UNENDLICH makes me that much more elated. Mike’s vision is just amazing. Another thing to note here, is that he does all the mixing and recording himself, in his home, up until the final mix and mastering. There have been talks of turning the project into a touring band, but I cannot make promises. I just know that if / when Mike decides to do so, it’s going to be an explosion. 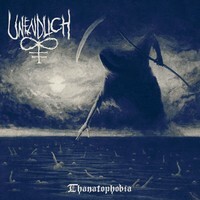 All you Black Metal fans out there NEED to check out UNENDLICH. It is everything you want from great Black Metal. Even down to the cover art, “Thanatophobia” is a great album! So do yourself a favor, and get on over to his Bandcamp page (link provided) and listen to the new album. Then the EP, then the other 2 albums.